I usually make my banana bread with walnuts and dates but today I decided to try something different. The dried elephant heart plums came out jammy and just a little bit tart. The pecans on top toasted nicely while the bread baked and gave a nice crunch. It was a big hit with our neighbors at last night’s HOA social committee meeting. Take the butter and eggs out of the refrigerator about an hour before you plan on starting to let them reach room temperature. Preheat the oven to 350°F. Prepare the 4 mini baking pans with butter. Cream the softened butter, sugar, and lemon zest with a fork until thoroughly combined. Mix in the eggs and then the mashed banana. Add salt and baking powder. 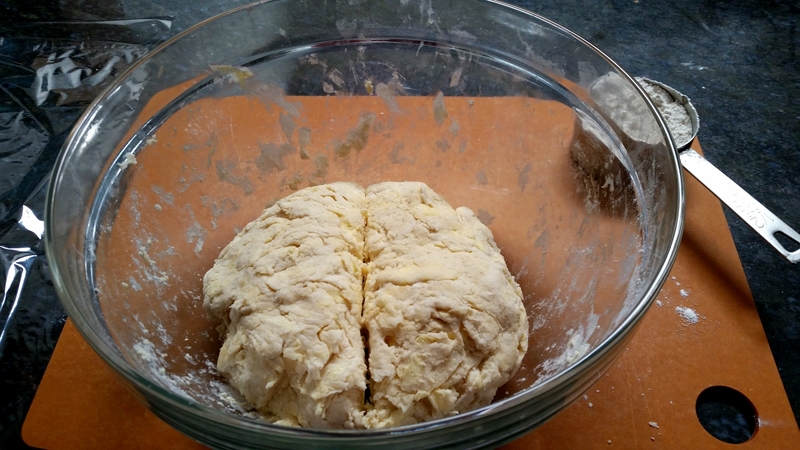 Then gradually add the flour until fully incorporated. Fold in 1/2 cup of chopped pecans (reserving 1/4 cup to use later) and the chopped dried plums. Spoon the batter into the prepared pans and top with the remaining chopped pecans. Bake at 350°F for 40-45 minutes, until a toothpick comes out clean. Let the bread cool in the pans for 10-15 minutes, remove from the pans, and then allow to cool on a rack completely before cutting and serving. Enjoy! Sometimes a recipe comes along that’s so good that it really doesn’t need modification. That’s how I felt about Ina Garten’s rugelach recipe. The only changes I made were to omit the raisins and to use 8oz of chopped pecans instead of a cup of chopped walnuts. Also, unless you’re super speedy in the kitchen, factor in at least an extra hour beyond Ina’s time estimate. Not only had I never baked a sweet potato pie before this one but I also had never tasted one either! I had heard from others that sweet potato can be even better than pumpkin for pie but I never believed it… until now. After getting around 3lbs of sweet potatoes from a local farm, I decided that it was finally time to experiment with sweet potato pie. I didn’t like most of the recipes I found online, each one for a different reason. So, I combined and adapted several to come up with my own. Though they weren’t the most beautiful pies because the crusts were a little shallow and uneven, husband and neighbors loved them. Make and chill dough for a pie crust of your liking. If you’re making two pies, use a double pie crust recipe. I was just a little bit short on dough and so my edges didn’t come out as high and wide as I would have liked. While your dough chills, start by boiling the sweet potatoes over medium heat for about an hour. After they cook, drain them, let them cool, peel them, and chop/mash before using. I like to blind bake my pie crust for about 15 minutes at 350°F to make sure that the bottom cooks through and gets nice and flaky. It was my first time using this method with parchment paper and a pie chain. I discovered that the sides of the pie sink down a bit with this method – not ideal but still better than soggy/raw crust. Next time, I might try filling the paper with dried beans instead to see if it does a better job of providing structure for the sides. While the crusts cook, prepare the pie filling. Combine all of the ingredients in one bowl except for the egg whites (and also the pie dough, of course). Start by beating the yolks with the brown sugar, add in the spices, melted butter, milk, and lastly the sweet potatoes. You can use a hand mixer to get a smooth texture. Next, beat the egg whites with a clean hand mixer until peaks form but they’re still glossy and wet. Gently fold the beaten egg whites into the rest of the mixture until just combined. Pour the filling into the cooled pie crusts. Bake at 350°F for approximately 50 minutes or until the filling looks set. You’ll notice that the pie puffs up a little bit like a soufflé while baking. When you take it out of the oven and let it cool it will deflate back down but will keep a light texture from those beaten egg whites. Let the pie cool to room temperature and serve with a dollop of freshly whipped cream, lightly sweetened with maple syrup. The plan was to make a huckleberry pie. Plans change. I ordered wild huckleberries from Good Eggs and realized only later that the $10 of berries that I purchased was only an 8oz container. Luckily, I had also ordered blackberries and raspberries. So, triple berry pie it became. I was soon to discover that this was only the first bump in the road. This site/blog isn’t about perfection and so I’ll share what I did, how it could have been better, and what I learned along the way. This is my first foray into the pie-making world. I grew up in a Romanian-American household that often smelled sweetly of delicious desserts but never of American-style pie. So, I was a little intimidated by the prospect of making my own pie crust. I did a little research online and more-or-less followed Smitten Kitchen’s well-written pie crust instructions, both how to prepare and how to roll and crimp. I didn’t want to cut any corners with this first pie and so even latticed the top of the pie. The raw pie looked lovely and was ready to bake. I had preheated the oven (we just moved and so this oven was new to me) to 375°F. However, I noticed that it didn’t appear to be cooking very quickly. I actually let it go the full hour before realizing that “preheat” on this oven meant just that. The oven turned off after reaching 375°F. Great. I also noticed some pooling of fruit juices on top and that some had even made its way through the crust (advantage/disadvantage of a glass baking dish). This modern, but less than intuitive, oven told me that it was actually around 200°F. I cranked it back up to the right temperature, this time on “bake,” for another 35 minutes. So, our pie came out very juicy. The crust on top was crunchy and buttery. The crust on the bottom did indeed soak through a bit, though it was fully cooked. I also learned that cutting the sugar used in other recipes made a pie that, as my husband said, was “addictive” when combined with ice cream. However, if you want to eat the pie without ice cream, add some extra sugar to the filling before assembling the pie for more a more traditional level of sweetness. So, this is clearly not a perfect pie but it was a fun first try at something new and it still turned out pretty delicious. Have any pie-making tips you’d like to share with a newbie? It’s the season to bake with berries! I couldn’t find a recipe I liked for today and so I decided to improvise my own. Preheat the oven to 350°F. Grease and flour a 9.5″ glass baking dish (or other type of baking pan of your choosing). Rinse the blackberries, shake off excess water, and lightly coat with 1 tablespoon of flour. Set these aside. Whisk together the olive oil, sour cream, eggs, lemon zest, and sugar. Many people like to combine the dry ingredients and then incorporate them into wet. I prefer to wash only one bowl and have not noticed a difference. So, I encourage you to just mix the salt and baking powder into the wet ingredients and then, lastly, whisk in the flour until combined. After the batter is ready, gently fold in the blackberries and pour the mixture into the prepared baking dish. Bake for 50-60 minutes or until lightly browned on top and cooked in the center. While the cake bakes, cook the reserved sugar and lemon juice in a small pot on the stove until the sugar has fully dissolved and then set it aside. After removing the cake from the oven, pierce the top in several spots with a toothpick. This will allow the lemon syrup to soak into the cake more consistently. Pour the lemon syrup slowly over the top and, if you see it pool on the edges, lift the cake slightly to allow it to drip beneath the cake. Use as much or as little as you like. My lemons were particularly juicy and so I did not use all of the lemon syrup. In fact, in future attempts, I may omit it entirely because the zest really makes it lemony enough for me. Allow the cake to cool, slice, and serve with a generous dollop of freshly whipped cream.